Salem State sophomore Gabby Cerro (left) laughs with Salem State junior Chloe Manousos as they build beds for children who don&apos;t have one. 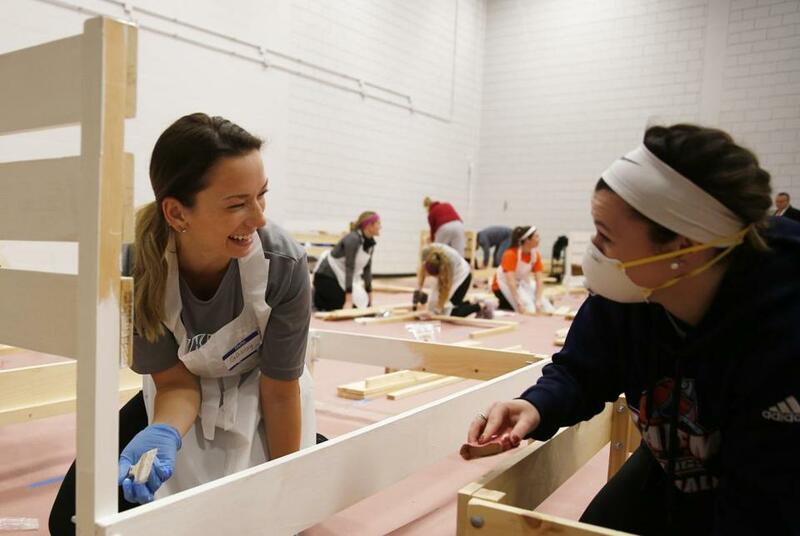 Salem State students and alumni gathered to build 50 beds in a four hour period as part of the Build-a-Bed challenge. SALEM -- The construction materials for each bed included a bag of bolts, a brief orientation, and the name of a child: Tara. Landon. Amie. The first bed, finished with a fresh coat of white paint, was built for a 12 year old named Grace, who lives with her family in Marlborough. The names were motivation for the nearly 100 volunteers at Salem State University’s first Build-A-Bed Challenge. Students and alumni worked in pairs, hunched over pieces of pine in a studio in the school’s O’Keefe Complex. For four hours they drilled, hammered, sanded, and painted dozens of beds, hoping to ensure restful nights for 50 children living in poverty around the state. Each hour, new pairs of volunteers arrived to help out. Some nodded. Others looked sheepish and smiled and shook their heads. Arcangel walked them through the basics, handing them a sheet of instructions and materials they would need. The event was sponsored by the Massachusetts Coalition for the Homeless’s initiative A Bed for Every Child, St. Jean’s Credit Union, the Salem State Center for Civic Engagement and the school’s athletics department. A Bed for Every Child receives 160 referrals per month, according to Robyn Frost, executive director for the coalition. At $250 a bed, delivered with a pillow, sheets, a mattress, and a box spring, the nonprofit needs to raise an estimated $40,000 per month. Salem State University is crowdfunding to cover the cost of the 50 wooden twin bed frames. The nonprofit helps a range of ages, from 2 1/2 to 21. Many kids are referred by public schools across the state. They might be in home situations where they’re sleeping with a parent or guardian, with siblings, on air mattresses, or on couches. Field hockey team captains Katherine Crane, 20, of Arlington, and Alyssa Drouin, 20, of Methuen, encouraged their team to participate. They worked on Grace’s bed, cheering when they were the first ones done. Sophomore soccer player Vashti Etienne, 20, said the spirit of the day hit close to home. The event also felt like the right thing to do for two ultimate-frisbee teammates. Jordan Hill, 22, a senior from Concord, got a lesson in how to use a drill from Sam Feinberg, 23, a senior from Lunenburg. They were providing a bed for a 16-year-old named J.J. who has been sleeping on a couch.